This year, we are about to celebrate the extended pongal festivities starting with ‘Bhogi’ (போகி பண்டிகை), which marks preparation for the harvest festival. On this day people discard old items, clean and whitewash their houses to celebrate good harvest and consequent good fortune. Bhogi marks the new beginning. 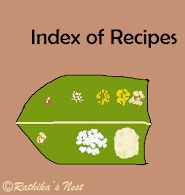 Chithrannam (சித்ரான்னம்) or variety rice is prepared on this day along with payasam, a liquid dessert. Pongal (பொங்கல்) is the harvest festival (உழவர் திருநாள்) celebrated on the 1st day of Thai (தை), the tenth month of Tamil calendar, and it corresponds to ‘Makara Sankaranthi’ (மகர சங்கராந்தி) celebrated all over India. Pongal is celebrated with great pomp in the villages. People thank the Sun God for the good harvest and offer the grains, vegetables and other produce to the Gods. Pongal is made with newly harvested rice and lentil, while freshly harvested country vegetables are cooked in the form of gravy. 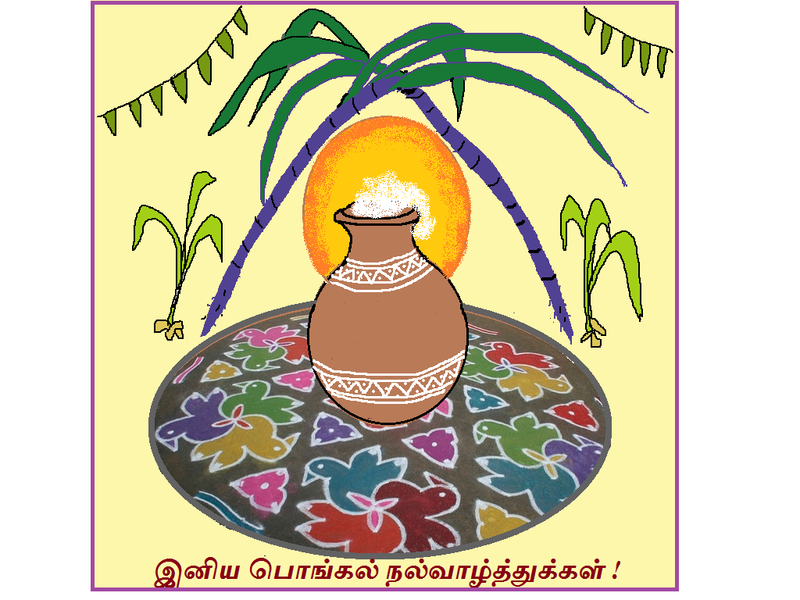 Both sweet pongal (சர்க்கரைப் பொங்கல்) and salted pongal (வெண் பொங்கல்) are made on the festival day. Houses are decorated with ‘rangoli’ (கோலம்) drawn in the front yard, while mango leaves, paddy, neem flowers and plantain trees are tied at the entrance. Traditionally pongal is cooked in a mud pot decorated with turmeric leaves and kumkum (குங்குமம்). After prayers, the family members eat the pongal and gravy. The second day of Thai is celebrated as ‘mattu pongal’ (மாட்டுப் பொங்கல்). On this day the cattle are decorated by painting the horns, placing kumkum on the forehead, and adorning flowers and bells around their neck. This day marks the veneration of the cattle, which provide milk and form an important part of traditional cultivation. Cattle are fed with pongal and banana on this auspicious day. In some Brahmin families, ‘Kalkandu sarkarai pongal’ is made instead of routine payasam on the second day of ‘Thai’ (கனு பண்டிகை). Coloured rice is prepared by mixing steamed rice with turmeric and kumkum. Turmeric leaves are spread on the terrace and coloured rice, sweet pongal and salted pongal are placed on the leaves for the birds to eat. In some villages, young men try to take control of bulls and collect the prize money or tamer's reward tied around the bull's neck. This bull taming sport is called ‘jalli kattu’ (ஜல்லிக் கட்டு). Let us pray for peace, harmony and welfare of all living beings during the Pongal festivities. Click here for the recipes of ven pongal, sweet pongal, thalatha kuzhambu and traditional mixed rice preparations for this harvest festival.